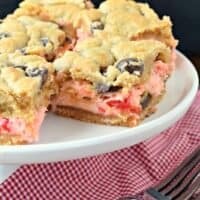 These Cherry Chocolate Chip Cheesecake Bars have a vanilla cookie crust and a creamy cherry cheesecake filling! 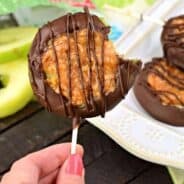 But, don’t forget about the sweet chocolate chip cookie topping to take this recipe to the next level of deliciousness! 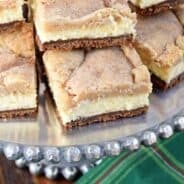 Well, here we are friends, with yet another Cheesecake Bar recipe. Just like I get on flavor ruts…I also become obsessed with certain desserts. 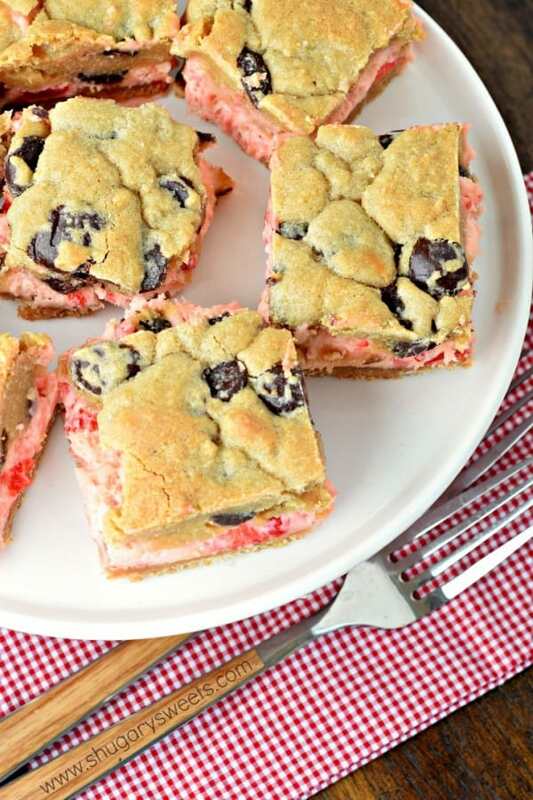 Have you made a cheesecake bar yet? You know, the kind with a crust, filling and cookie dough topping? 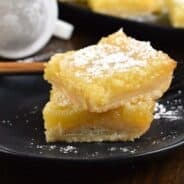 I have so many you can choose from, starting with Lemon Cheesecake Bars, Snickerdoodle Cheesecake Bars, and even Pecan Pie Cheesecake Bars. 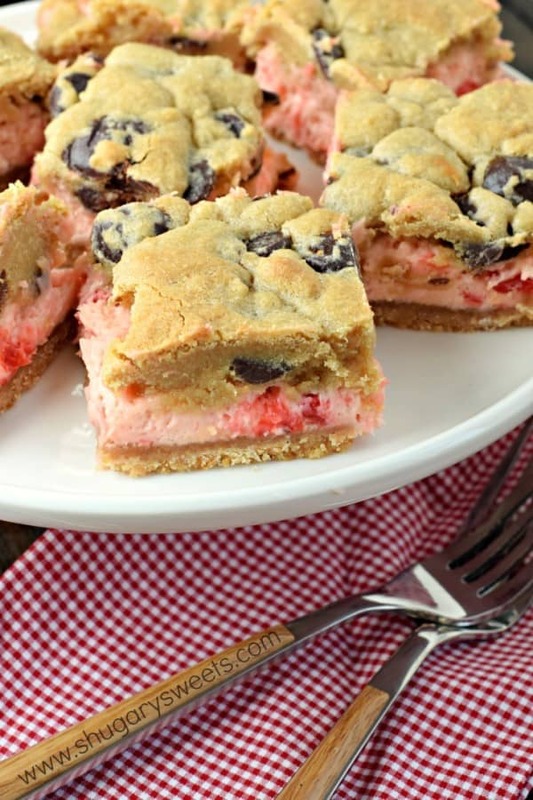 But today, we’ve got this delicious Cherry Chocolate Chip Cheesecake Bars recipe! I never know what kind of mood I’ll be in when it comes to the crust of cheesecake bars. Sometimes I choose graham crackers, sometimes OREOS, and today, I’ve got Nilla Wafers. I love the simple, buttery flavor they give these bars! This bar is all about the filling though. I chopped up 20 (yes I counted) maraschino cherries for the cheesecake center! Once you beat your cream cheese, sugar and eggs until creamy, then you can add in your chopped cherries. Give it a quick whirl with the beaters until pink and blended! Spread this over your crust layer. And finally, the chocolate chip cookie topping! I used a homemade cookie dough with Ghirardelli dark chocolate morsels, but feel free to use a roll of prepackaged cookie dough if that’s easier for you! It’s going to be amazing no matter what route you choose. One thing to note…when you pull these out of your oven (at the 33-35 minute mark) the center will be a little jiggly (or a lot jiggly). If your cookie dough is nicely browned, trust me and have faith. This isn’t a recipe you’re going to bake and serve immediately, so plan accordingly! Once you’ve allowed this to cool on your counter, you’ll want to refrigerate for 4 hours!! I usually let it just chill in the fridge overnight and serve it the next day! It’s amazing you guys. And it’s even better because if you want something delicious that can be made in advance this recipe is for you! Now. What should my NEXT cheesecake bar flavor be?? 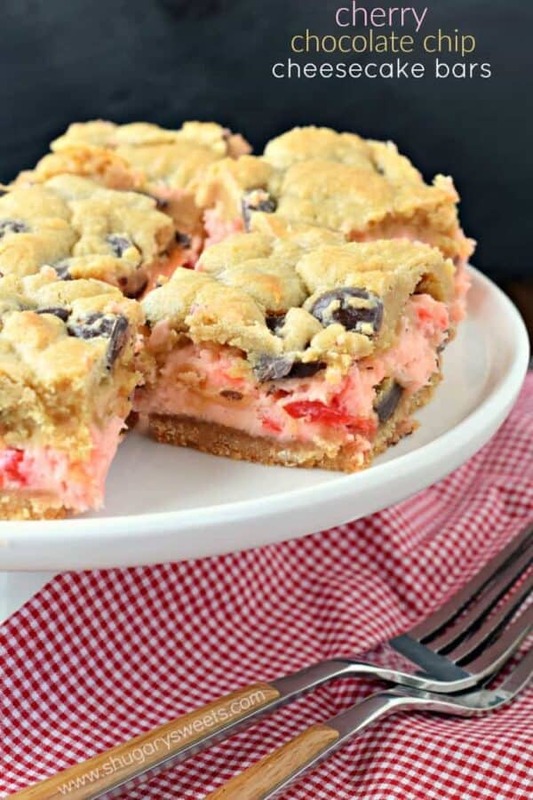 These Cherry Chocolate Chip Cheesecake Bars have a vanilla cookie crust and a creamy cherry cheesecake filling! But, don't forget about the sweet chocolate chip cookie topping to take this recipe to the next level of deliciousness! Line a 13x9 baking dish with parchment paper, set aside. Preheat oven to 350°F. In a food processor, pulse Nilla Wafer cookies with sugar until fine crumbs. Drizzle in melted butter and pulse until combined. Pour crumbs into bottom of baking dish. Using palm of your hand (or bottom of a cup) press crumbs firmly until they are combined (and slightly hardened) in bottom of pan. For the cheesecake filling, beat cream cheese with sugar and eggs using the whisk attachment of an electric mixer. Beat until fluffy and smooth, about 3-5 minutes. Add in chopped cherries, giving it a few stirs until smooth and combined. Pour over cookie crust. For the cookie dough, beat butter with sugars for 2 minutes, until combined. Add milk, egg and vanilla. Beat until mixed. Add in flour, salt and baking soda and mix until fully combined. Fold in chocolate chips. Drop by large scoop onto top of cheesecake layer. Try to use your fingertips to spread gently until cheesecake is covered completely. Bake in a 350 degree oven for 30-35 minutes. Remove and cool completely. Once cooled, cover with plastic wrap and refrigerate for 4 hours or overnight. Cut into squares and enjoy!! 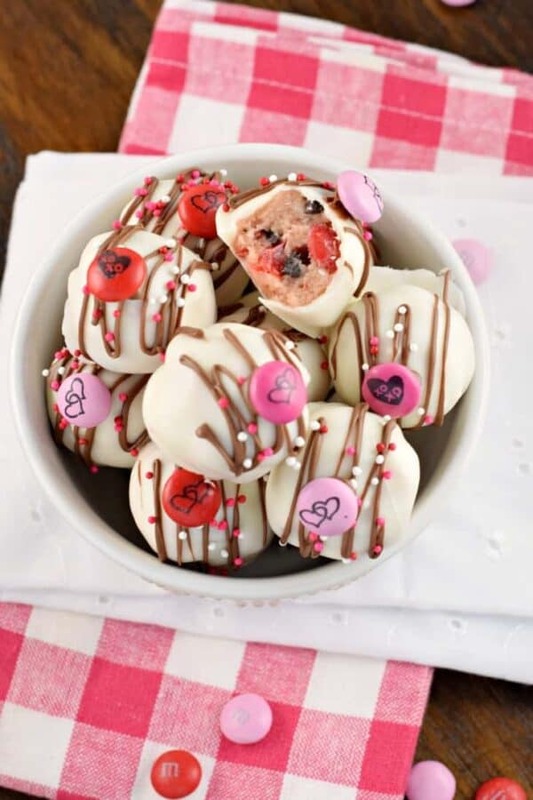 Cherry Chocolate Chip Cookie Dough Truffles: as good as they sound! 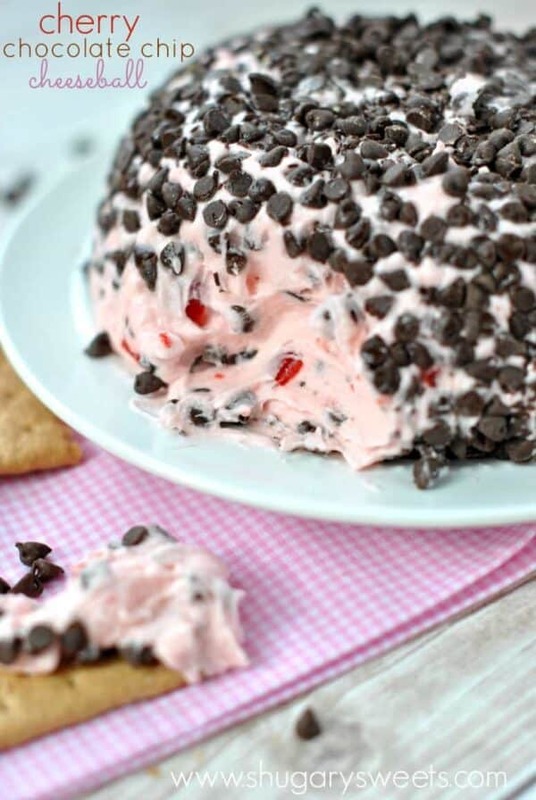 Cherry Chocolate Chip Cheeseball: a delicious, sweet cheese ball recipe for a crowd! Cherry Chocolate Chip Shortbread Cookies: the crisp, buttery of shortbread paired with sweet cherry and chocolate is perfect! I love these kinds of bars – every single one!! Love the jiggly tip too – so important for people to trust in the browned edges, ha! 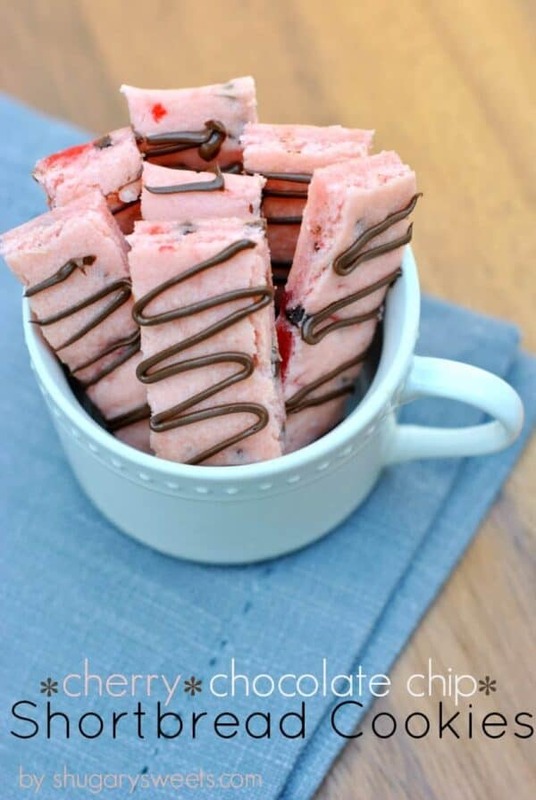 Oh, these look soo yummy! Nothing ever beats a cheesecake bar. 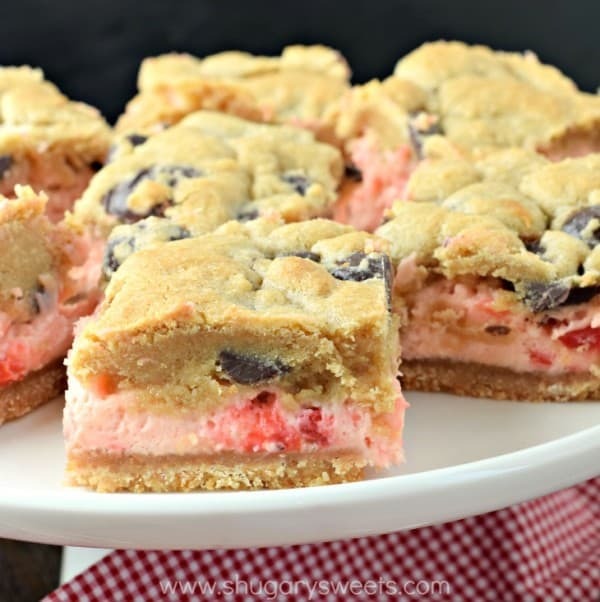 And you had to go putting cookie dough on top to make it the most irresistible bar ever. Well played, Aimee! I love that you counted how many cherries you needed. That’s a happy dose of maraschino! These bars sound delicious! I love cherry and chocolate together. I like the idea of combining cheesecake and chocolate chip cookies. They are two of my favorite things! Yum!